This is a project that has been in the works for well over a year. 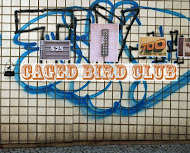 The Caged Bird Club's intent is to reclaim space in order to make cities more beautiful and livable and that means nature needs to be one of our beneficiaries. 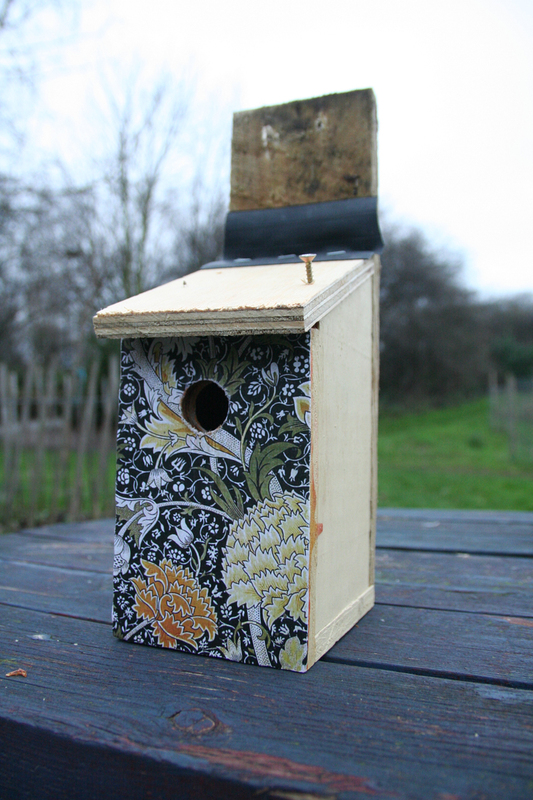 Every part of these bird boxes is made from someone else's waste; the wood was tossed out, the paint was returned to the hardware store by unhappy consumers and the bike inner tubes holding the roofs on were punctured beyond repair. The reason it took so long to finish them was because we couldn't decide how best to decorate them. 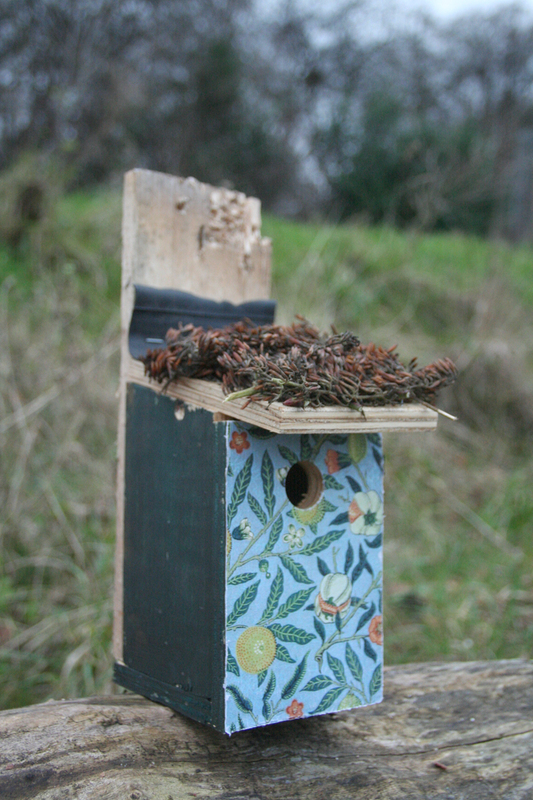 The front of bird boxes shouldn't have anything toxic on them because the residents will regularly peck at them. We had a disastrously ugly experiment with Kool-aid and the boxes sat there gathering dust for a long time. 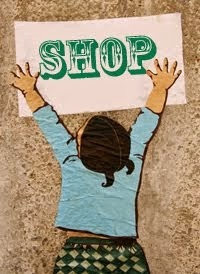 Then the idea to wheat paste William Morris wallpaper designs to the front struck us. 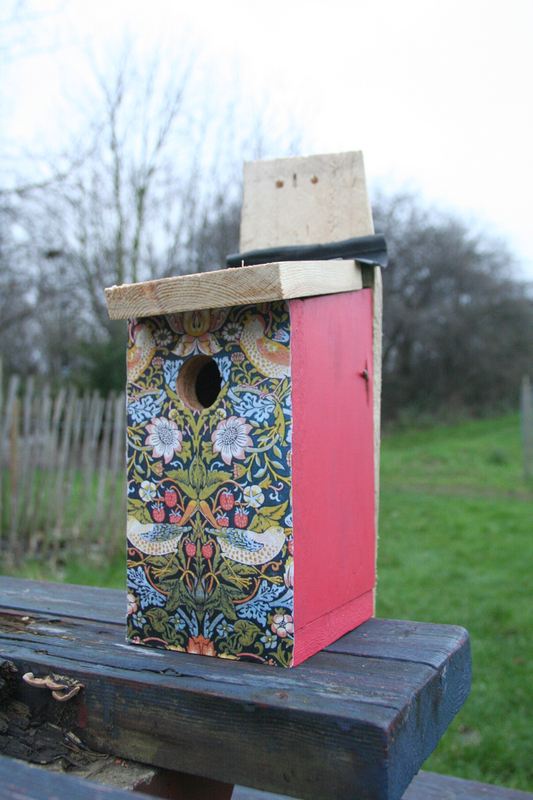 William Morris, although for the most part a city dweller, adored nature and took much of his literary and political inspiration from the natural world. Living through the Industrial Revolution, he witnessed the start of the wholesale trashing of the environment for progress, capital and empire. He saw, and was outspokenly critical of, the misery it created for humans and non-humans alike. Many of his designs demonstrate the mutual dependency between different natural elements that, unlike humans were starting to do at that time, they cannot take for granted. Here, the birds are surrounded by the strawberries they will eat to survive and that rely on them to scatter their seeds. 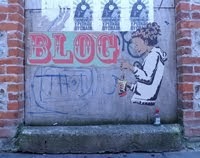 We also added some of our own little touches. 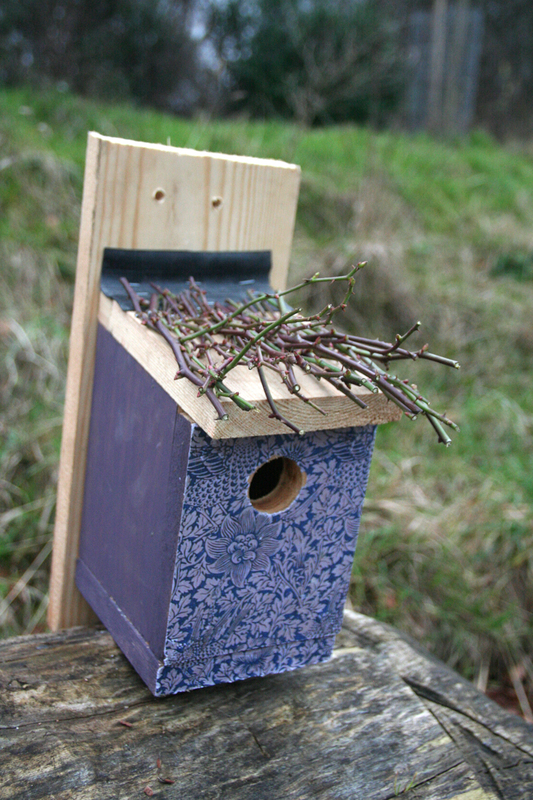 This box includes a roof of thorny wild rose branches to keep potential predators away from the vulnerable chicks. The roof on this one mimics a traditional English thatched roof using the spent blossoms of the butterfly bushes that grow like giant weeds all over the city. 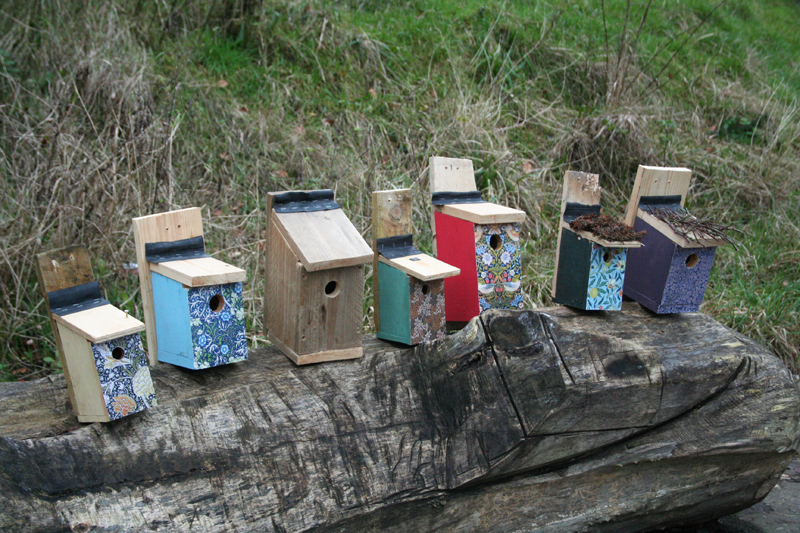 It made perfect sense that if the birds inspired these beautiful designs, it was fitting to give some of that beauty back to them as a mark of gratitude all these years later. 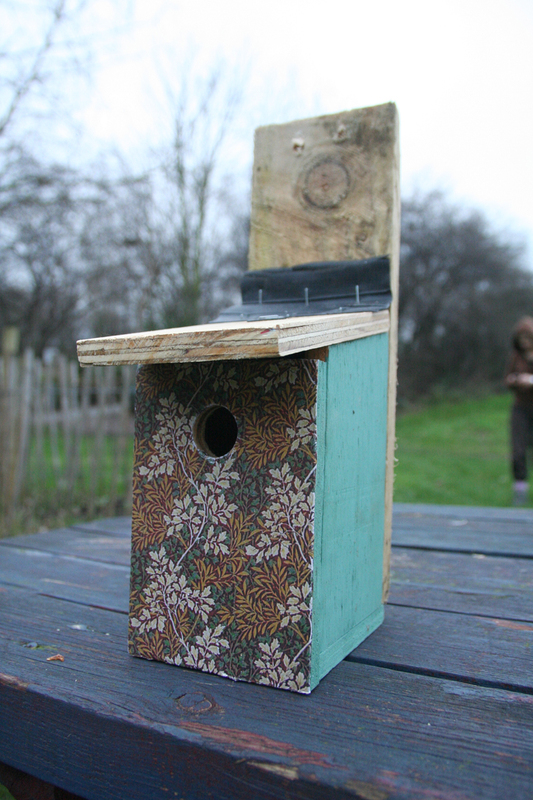 But the other reason the bird boxes sat in a corner is because we never found the perfect place to put them. When a bunch of us got involved in a project to turn a disused, formerly industrial concrete yard in our neighborhood into a raised bed community garden, it all came together. 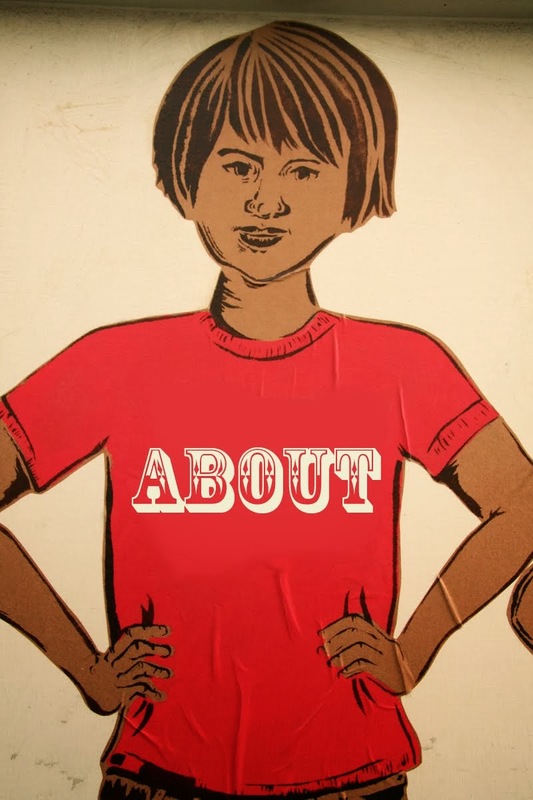 It is an attempt to take control of a spot that greedy developers would love to get their hands on in an endlessly gentrifying area of London. 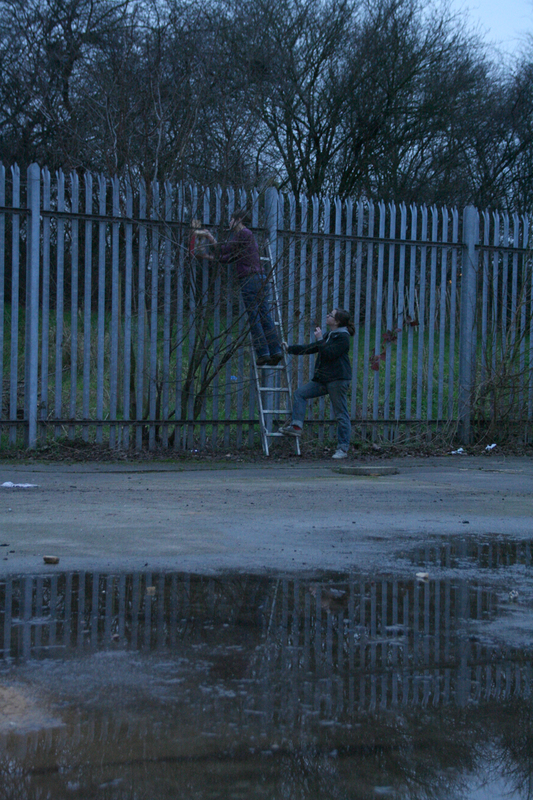 We put the boxes up on trees and the forbidding, spiked fence around the space we are transforming in the hopes that it won't just be vegetables that return to this corner of Hackney. 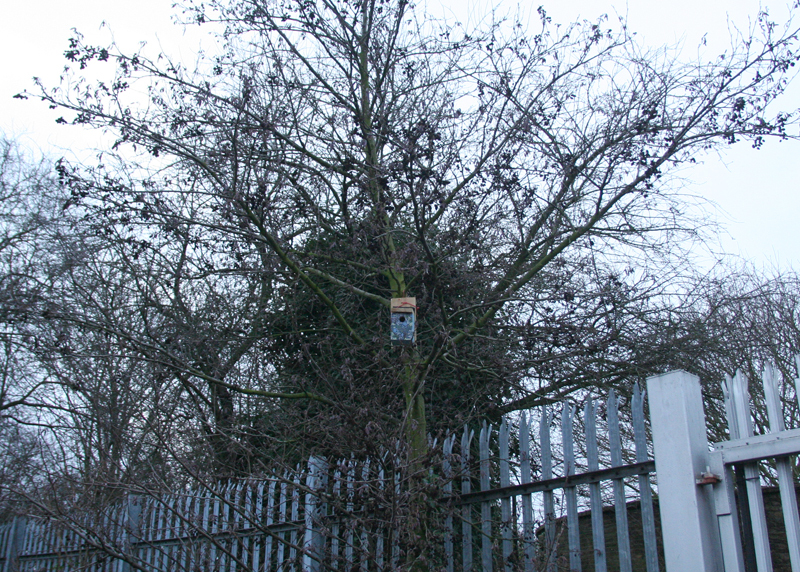 Some of the locations may look ugly and unwelcoming to us, but they are just the type of sheltered spots that birds look for in cities. The whole day, when we were building the raised beds and finishing the bird boxes, this little guy was hanging around curiously watching what we were doing. 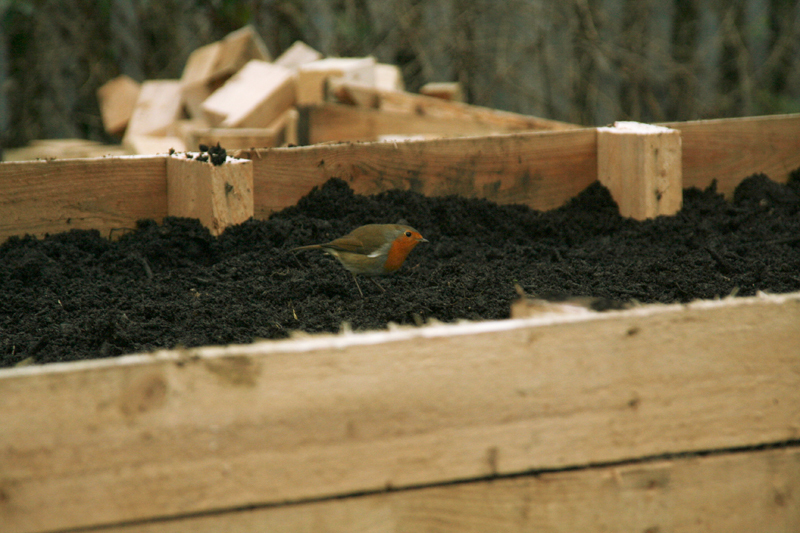 As soon as we filled one of the beds with compost, he was in there digging for worms. It's definitely a start and we'll be back with robin appropriate boxes asap. 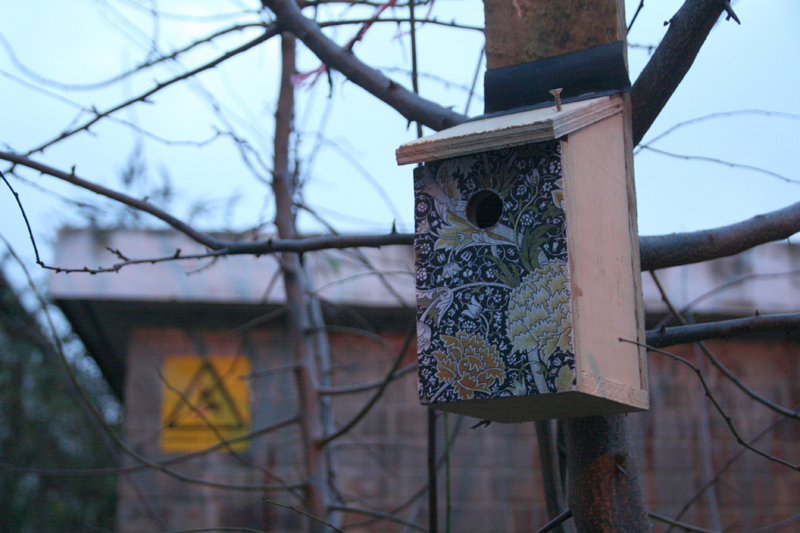 Boxes hung all around the concrete yard and community orchard in Haggerston Park, off Goldsmiths Row in Hackney.